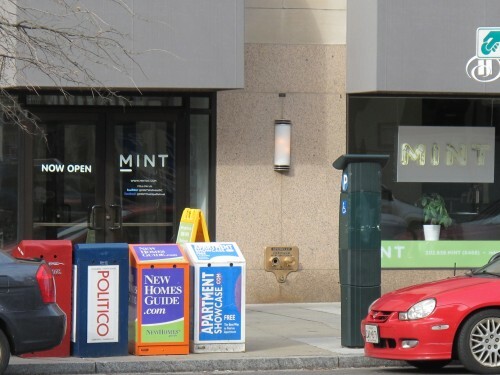 Here is a mystery and something that has bugged me for years in DC – whats up with all those newspaper boxes all over town? Who regulates them? Does DC get any money from their use of public space for advertising? It seems like every other corner has 6-8 boxes lined up in varying states of decomposition – falling over, tagged and stickered, broken and busted – adding so much ugliness to DC. Is there any hope that my dream of a totally reigned in newspaper box DC will ever become a reality? Hmm, this is an interesting question. Well, first – do you guys find these boxes as ugly as the OP? Second, do you know if the city regulates them? And finally – do you think through technology and natural evolution they will end up going the way of the public telephone and dodo bird anyway? If so how long – 5, 10, 20 years?